Welcome to our weekly review (from someone who grew up there during that time and has chronicled the 20th century history of her hometown) of Vegas (2012), the new drama on CBS starring Dennis Quaid and Michael Chiklis. Quaid plays Sheriff Ralph Lamb, the real life Sheriff who squared off against the bad guys in 1960s and 1970s Las Vegas. Chiklis plays Vincent Savino, a Chicago mobster who has come to Las Vegas because his casino, The Savoy, needs cleaning up. Jason O'Mara plays Jack Lamb, Quaid's brother. Where Ralph is quiet, taciturn and hard headed, Jack is "much better with people". Carrie-Ann Moss plays fictional deputy district attorney, Katherine O'Connell. According to her character, her family had the ranch next to the Lamb family. She and Quaid have chemistry together and the story hints at a backstory between the two. Lamb is a widower when we meet him with a young son who looks to be in his early twenties. Right now, all four main stars are playing archetypes instead of characters. Here's hoping that CBS allows them to develop the characters and become the strong drama that is evident but sadly, in the background right now. The opening scene begins at the Lamb ranch as Ralph, Jack and Ralph's son were rounding up the cattle. A DC-4 came in low and scattered the cows. Ralph got angry, saddled up and headed to the airport to confront someone about the problem. At the airport, he found the official he was looking for and a fight ensued as Savino was disembarking from the plane and headed toward his ride. The pilot focused on the murder of a young girl who worked in the credit department at the Savoy Hotel but whose body was found out at the Nevada Test Site. The mayor, Ted Bennett, (Michael O'Neill), who knew Ralph in the war and fed up with the current sheriff (who more likely than not is corrupt and up in Reno on vacation with a young woman not his wife), sent a deputy to the Lamb ranch to get Ralph. Unbeknowst to the Mayor, Ralph was headed into Las Vegas in the back seat of a squad car, arrested for the fight at the airport. The blue/green screen work of Fremont Street, circa 1960, was quite good (though the far end of Fremont Street was missing the neon Union Pacific sign that anchored the old train depot). As with other CBS procedurals (see NCIS, CSI: Las Vegas, Criminal Minds, etc), the story focused on the crime and by the end of the episode Ralph had kept his friend, Katherine O'Connell from arresting the dead girl's boyfriend, a rodeo rider, for the crime and had figured out who the real killer was. A sub-plot involving bikers tearing up the town brought back memories of the original story of Lamb facing off against Hell's Angels in the late 1960s. At the end of the hour, the original sheriff had been dispatched thanks to the district attorney and Savino's crew and his murdered body had been found, prompting Ralph to take the job on full time. Quaid's character is very much cut from the same mold as Jethro Leroy Gibbs on NCSI but, hopefully, going forward, he will become his own character and not a mirror image of the beloved Gibbs. Michael Chiklis has the harder role, especially right now. Vincent Savino is a hood from Chicago with very little back story. He and Quaid are on the path to a showdown but without more character, back story and story telling, that showdown could ring hollow. If cable dramas from Justified to Breaking Bad to Mad Men has taught viewers anything it's that it's possible to mine the depths of character and create a compelling story that brings viewers back every week to see what happens and propels the story forward. CBS has two shows that they have allowed to do that- The Good Wife and Person of Interest. Here's hoping CBS gives Nick Pileggi (author of Casino) and showrunner Greg Walker (Without a Trace), the freedom to do what Robert and Michelle King and Jonathan Nolan and Greg Plageman have done for their shows. Pilots are always tricky to judge how a series will play out because so much has to be established in a short amount of time and networks want to hook viewers. It's doubtful people are tuning in to watch CSI: The 1960s and are much more interested in watching "the battle for the soul of Sin City" as the ads tout the premise. If CBS gives them the freedom to make the latter, it will make Vegas a show worth watching and worth investing in. The opening scene with the DC-4, Ralph and the airport: McCarran Airport was a small airport but not quite that small. If it was supposed to be Alamo Airways, it wasn’t close. George Crockett would not have allowed something like that. The showroom at the Savoy had good production design. The showgirls were very Copa like. But I'm still not sure where The Savoy is located- Fremont Street or the Strip? Interior of the The Savoy was very nice, the exterior too far out to the street. Unlike today, hotels on the Strip had long drive ways, a porte cochere and were built to catch the eye of drivers. If it was supposed to be on Fremont Street, it was out of place. The showroom with the Copa-like showgirls made me think it was supposed to be on the Strip. To their credit, someone did their homework because they got the interior right. Strip casinos back then weren't covered end to end with slots and gaming tables the way they are today. Great job of Fremont Street. Only problem was it looked like the Fremont hotel was briefly on the same side of the street as the Nugget. If so, oops! Also, oops, the Golden Nugget had a weeping mortar facade, not the fake MCM facade seen on the show. Great seeing William Russ, even if it was too briefly. (Made it a nice shout-out to Wiseguy, the Ken Wahl show that included a law man and a gangster one season). Russ plays a well-connected real estate owner who owns a great deal of land (either on Fremont Street or the Strip, that part wasn't clear) and the local BBQ joint (nice neon) that wasn't really part of the Fremont Street landscape but Fremont Street back then had a number of popular eateries that catered to the locals as well as the gamblers, so it fits. Hopefully, Russ is a recurring character. Dennis Quaid has a great face for the part (bad haircut and all) and Chiklis is terrific as Vincent Savino, even if his character needs more meat on his bones. Props to the Production Designer, Marek Dobrowolski, for creating various sets that while they may not be historically accurate, evoke that era before post-war Las Vegas exploded into the Entertainment Capital of the World. Director James Mangold (3:10 to Yuma, Walk the Line) brought the flair and drama in equal proportions. Nice shout out to Warm Springs. We used to go to Warm Springs when I was a kid in the early 1960s. Nice neighborhood Ralph’s son’s chippie lives in. Seemed very Vintage Vegas. 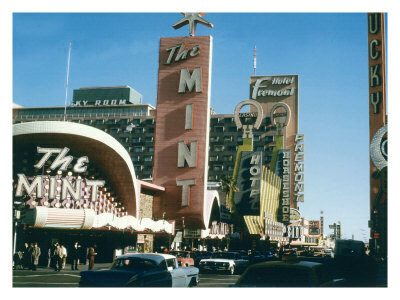 A casino that was modeled after the Mint!!!!! (Looks like it’s called, The Dice Club) You could see the arch of the pylon sign through the window when Mayor Bennett was talking to Katherine and the district attorney. And for the record (I've seen viewers criticizing them for this point), there were a small handful of pioneering female lawyers practicing in Las Vegas in 1960. The Boulder Club got a shout out (though it was in the wrong place)! The Silver Palace was in the wrong place but the two story buildings that you could see from the Mayor's windo were spot on. The Nevada Test Site is a bit of a hike to dump a body but it makes for good story telling. Though there was still above ground testing going on so the possibility of getting on the Site to dump a body or a bunch of bikers going for a ride out there were severly diminished. And for the record, Boulder City is nowhere near the NTS. Quaid and Moss have good chemistry. Quaid and Chiklis have a good adversarial relationship. Ralph's son isn’t a teenager (thank you Lord! ), is lippy and has good chemistry with O’Mara. It wasn’t quite as rural as they would like you to believe. Westward Ho neon was a nice touch, very retro would have been better to be the Yucca or the Rummel (both are still standing). The DA is crooked or certainly appears to be. Where are all the smokers? Here's hoping they do something good and dramatic with it. Feel free to leave comments!!! !